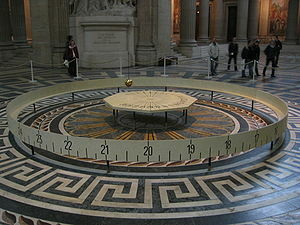 The pendulum of Foucault in the Pantheon in Paris is a work of conceptual art avant la lettre, a brilliant concept and installation which did what few other things have done, not even space-travel, that is: bringing the inertial rest of the universe and its regular heartbeat back home. There is probably no other phenomenon which can teach us so much about space and time as the pendulum does, except for its nephew the gyroscope (flywheel). No theory of space, time and ‘gravity’, which ignores the principles and teachings of the pendulum and the gyroscope, can ever hope to be viable. It never can. Since Einstein’s theories of relativity ignore, sometimes even contradict, these most basic facts of the heavens, they can only do so to their own peril. They won’t stand. Nevertheless there are insights in relativity which can be salvaged and calculations which seem to work in certain extreme circumstances, but that is like Newton’s Laws, they are perfectly usable to this day, but within a certain scope; the same will prove, I expect, for relativity-theory, of which the concepts of space, time and gravity are conceptually inadequate, just like Newton’s. So what we have to do is scrutinize the assumptions on which the theories eventually falter and build ourselves concepts of space, time and inertia (‘gravity’) on the facts about them we know for certain and without controversy and there are many now. 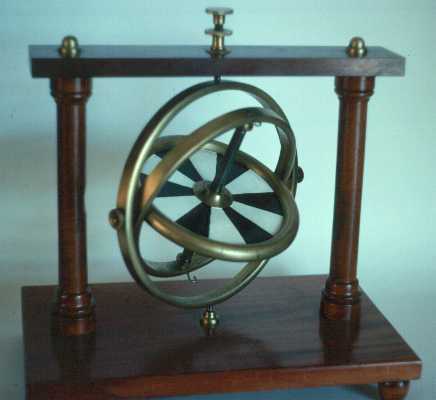 The pendulum swings in Paris since 1851, but the small gyroscope, another exquisite ‘mobile’, conceived and named by the same Leon Foucault a year later, in 1852, is an even more enigmatic and seemingly useless device. The device is since 1917 (Tedco, unchanged) for sale as a children’s toy, so the ‘magic’ of these devices was very well known, it is therefore remarkable that Einstein has been able to sweep these glaring refutations of his relativity principles under the carpet, with the whole scientific community looking on. Contrary to what Einstein claimed inertial space (gyroscope) is the universal rest-frame, but no energy can be at rest relative to this rest frame. No substance is in motion relative to the deep-field, all substance is the deep-field, only the form moves, not its substance, the form moves through the deep-field like a wave, this is the paradox. Movement without self-substance, that is the character of the wave and consequently of the material world. Although we know that Einstein’s early leading concepts of ’empty relational space’ (Leibniz, Mach) and of the ‘relativity of rotation’ (Mach) overlook the inertia of rotation and of cyclic motion which only manifests in (equal) intervals, his use of the terms ’empty space’ and ‘void’ lingers on; in the important ‘vacuum’-concept for instance, and in ‘Nothingness’ (see: a Buddhist cosmology?). The consequence of this is that most probably the complete rotational inertia of the stars, their systems and even of the galaxy itself is overlooked (‘all is relative’ after all, not? ), which has brought the whole of astrophysics into disarray. Scientists call it Dark Matter, but it is essentially a type of Inertia they cannot explain, they think that other matter causes the inertia, like Mach and Einstein, but it is the inertia of rotation, which both gentlemen overlooked, which causes the inertia of the nearly solid moving galactic disk. It is the inertia of the deep-field where the concept of ‘dark matter’ dissolves. The galaxy since its origin from a large galactic nebula has been contraction and condensation of space. From this collapse much of the initial angular momentum of the galaxy originates conserved in the rotation of the stars etc. But another very slow rotation takes place in the deep-field where the whole fabric of space is curved in a vortex, which leads to the border-point of space, the Black Hole. Einstein did not realize that, by hammering on the constancy of the speed of light, he himself introduced the inertial rest-frame of space, while ostentatiously denying he needed it, ‘constancy’ is though indeed the basis of the inertial electromagnetic field, since constancy reflects inertia and it, indeed, as inertial field does not move, but for its internal vibration, the so-called ‘speed of light’. This is why for any relative movement of objects the speed of light is always the same, it is the rest-frame speed, because the substance of objects doesn’t move relative to the rest-frame, objects ‘light-up’ in the rest-frame as an image on a screen and move as such only as form. Matter is an excitation of the deep-field. It is the 4% which has condensated into standing wave fields, our phenomenal world, the rest of substance is ‘unborn’ deep-field. The confusion arises from the paradox of a deep-field being at rest and in motion at the same time, but this has more to do with vague concepts, than with intelligibility. Imagining a vibrating field at rest is absolutely no brain gymnastics for us, we’ve seen it in the heat of a warm day, or in a fata morgana. When we though confuse the waves with the field, we are in trouble. Without an aether wave and field are the same, but this brings confusion, because a wave cannot stand still, although it may seem so, like in the standing wave. The field though can stand still and does so in the case of the deep-field of space-pixalls (Maxwell’s and Einstein’s singularities), the waves move through this field of tiny zero-point fields, in that sense there is a rest in vibration (Lorentz’s aether). Waves need a medium as everybody knows, but Einstein said that waves go through empty space like that, and that is the received wisdom ever since. Many scientists think of electromagnetic waves as without medium. It is now called a ‘physical property of space that it transmits waves’, which in fact amounts to describing a medium, an aether, of some sort, but veiled by the description. After all how can ‘Nothingness’ have characteristics, let alone properties? It is in fact the introduction of a preferential inertial rest-frame, being ‘the speed of light’, which made Einstein’s calculations successful and compatible with Lorentz’ unmoving ether (transformations), but this alliance with ‘inertial space’ renders his actual theory and its professed principles groundless they in fact confirm Lorentz’ ‘absolute’ ether, unwittingly. That the speed of light is the same in all directions is confirmed by all the fields coming in from all directions, look at the stars, all at the same speed, far or near. Light does not tire, because light does not travel, only the waves stir the deep-field and make the pixalls shine. Because these fields come in from everywhere, anywhere you go, you will be carried by their momentum in resonance embedded in the deep-field. This is the reason that bodies uniformly move along, not a straight line as Newton claimed, but along the local geodesics (Riemann, Einstein) of space, curving like a river through the depression between the hills; experienced from a floating body in the middle of this river it seems as if it is at rest on the surface of the massive moving body of water and it is the shore which moves past equidistant on both sides, that is relativity. All our long ‘straight lines’ follow the geodesics of Earth, they seem straight to us, but are not so seen from a location outside our curved ‘gravity well’; our ‘lee-field’ . The lee-field is the space around an object which is as a ‘pressure shadow’. Because the object blocks the cosmic field-pressure, it creates a depression in the local field-pressure around its body. This relative lack of pressure makes other objects move that way because it creates a field of least resistance, the lee-field. So it is not attraction but indeed a lack of pressure, a pressure differential which changes the geometry of space. So any lee-field causes an acceleration in its direction in any object that passes within its lee-field ‘reach’. What ‘seems’ straight is not ‘really’ straight in our world. You are thus not excused when you don’t see the sea horizon from the shore as a curved line and don’t notice the arc of clouds bending far beyond it. (Take your binoculars with you when you go to the sea shore, the water-horizon is near, a few miles, like a barrier, a stage, the arched cloud-horizon far away, 20-100 miles, depending on how high the clouds are.). That, now, is the real curvature of our planetary living space and the ground we stand on, caused by the spherical cosmic point pressure on all the border points of space (space-pixalls); the atmosphere, like the earth is curved as any sphere. These utterly obvious manifestations of curvature of space by the lee-fields of masses are ignored by scientists. The rest frame of the electromagnetic field is equivalent to inertial space, it is an expression of the cosmic deep-field with its uniform motion. The deep-field itself is beyond time, but its local geometry (inertia) induces a rate of change in its environment through local lee-field acceleration, (presently called: local gravity). This is how inertia is the basis of local transformation, of local ‘time’. There is no better way of showing local time than by the pendulum. The period of the pendulum, that is, the time it takes to make a full swing, does not depend on the weight of the pendulum, neither on the amplitude of the swing (in principle), as young Galileo realized, but only on the length of the suspension, that is the radius of the swing (in principle), so you can change the period by changing the length/radius (L/r). What is hidden from us is that the defining factor is not the radius of the swing, which we can manipulate and is trivial, but the acceleration due to the inertia of the earth, which we cannot change (in principle). The same pendulum on the moon swings much slower, so that shows the real relativity of time, directly related to gravity/inertia. So what we see is that the period of the pendulum, that is: its rhythm, its time intervals, is dictated only by the universal condition of acceleration due to inertia of the local space. This is how inertia is the basis of our concept of time. Our whole environment is shaped by local inertia, especially living nature is built on ‘with-standing’ local gravity and changes with a constant rate of transformation. When local gravity would considerably increase, you could weigh twice your normal weight, wouldn’t you go slower? Imagine, branches would break from trees, flowers would fall over, birds couldn’t fly, elephants could no more get up. Higher life would end in a couple of years. Possibly the dinosaurs succumbed to a continuous increase in inertia due to an increase in the lee-field pressure of the earth, because of the impact of increased local pressure through a temporary solar system anomaly, consequently they became too heavy to move on land, maybe they even lived submerged in lakes for a long time with only their long necks above the water and maybe other species, like whales, have survived by moving into the sea or becoming amphibious, like hippos and crocodiles. Absorbing catastrophes and using and spreading their momentum is possibly one of the chief principles to secure nature’s continuity; the subsequent environmental changes shaped evolution, as few other things probably do. So maybe not natural selection but adaptation to changing environmental condition is a main cause of evolution and its diversity. It is not ‘survival of the fittest’, the notorious adagio, but survival of the best fitting. Every species is the intelligent reflection of a sum-total of an environment, it’s found a niche and it is this environment itself that has changed and keeps changing. Ice ages may be long term resonances of major systemic catastrophes and the resulting imbalances in the solar system. But don’t dare use this wide ranging truth to trivialize the present climate change, because we don’t know, I repeat, we don’t really know what is going on and neither do the scientists on all levels, but something deeply unusual is taking place and then when you don’t know, you’d better not pretend you do, but be very careful when the quality of your life and certainly that of your child’s children is at stake, it’s about the suffering of future humanity, which rather strongly relates to future happiness. By all means the way we go about this atmosphere, which is comparatively as thin as an egg’s skin, no , not it’s shell, but indeed just the thin skin, and our atmosphere is comparatively thinner, the way we go about it, borders on the insane. Many civilisations have perished because they exhausted the vital resources of their existence, unknowingly; we know all this for more than 50 years, but it is too much, we don’t know how to stop this huge flywheel, its momentum, so we keep pushing it, giving it ever more momentum in its cancerous growth and then we close our eyes…..
We can learn something from the resonances of the solar system, how nature absorbs catastrophes and spreads their momentum over time, by inertia, by slowing down. The resonances of the big system affect our lives, the whole of living nature. Better get to grips with it.